Venue says Simmons Bottomless NYE is back! Celebrate in style, with all drinks included! Tickets from £35. A Euston Square branch of the informal, city-wide bar chain. 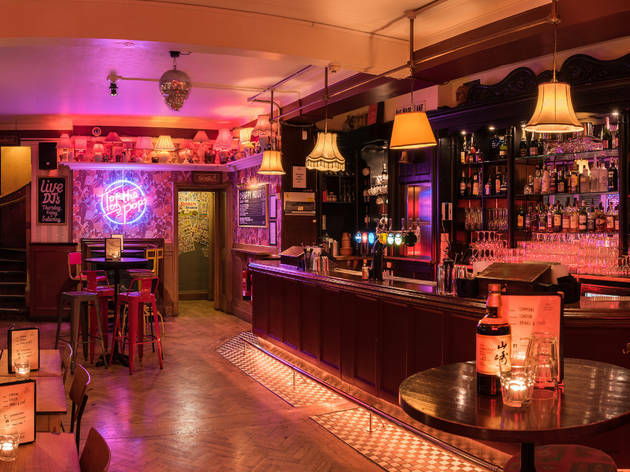 Simmons Euston Square offers the perfect spot for an after-work drink and late night dancing, with a Happy Hour that lasts for five whole hours! Join us from 4pm - 9pm Monday to Friday to enjoy bottled beer and spirit & mixers for £2.50, glasses of wine for £3, bottles of wine for £12, 2 cocktails for £10 and cocktail teapots for just £15! From 4 - 9pm on Saturdays indulge in 2 cocktails for £10 and cocktail teapots for £15. For tables of 6 and over quote "The Weekend Just Got Better" when booking and you'll also be eligible for a complimentary bottle of Prosecco! Great prices! Great bar! Tom the bartender was amazing and fun to watch as he mixed drinks. Nice happy hour and cocktails in teacups. Have been to this bar of various occasions for works functions as its local to our companies offices, always great service and great selection of drinks and deals especially during happy hour. Amazing happy hour, really can't complain when beer/wine/spirit and mixer are £2.50. Also who doesn't love old school tunes! Recently discovered this place and think it'll become my new local, I love it. Hosted a lovely work evening do, and took advantage of the £2.50 beer and wine on HH. Great spot! £2.50 beers, great music and friendly crowd and staff. Keep up the good work! Great spot for after work drinks. Long Happy Hour and cute decor!